For some, the appeal of trekking in a remote region such as the Khumbu region of Nepal is that it offers an escape from the constantly connected life back home. No annoying emails from your boss, random Facebook posts or filtered pictures of food on Instagram – just yourself and the nature surrounding you. While that does sound appealing, it is now well into the 21st century and almost every region, no matter how remote, is connected to the web. Mountaineers document their progress by live streaming videos, posting pictures and tweeting from the slopes of the world’s highest mountain. From people wanting to experience some of the thrill of climbing Everest to concerned parents wanting to know how their son or daughter is progressing on the base camp trek, the internet occupies a vital role on Everest whether you like it or not. 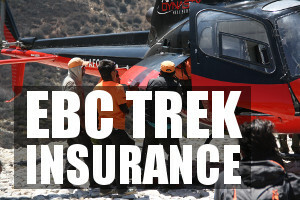 The obvious benefit of having connectivity in a potentially dangerous area like Everest is safety. SOS calls, map routing, location beacons, emergency medical calls and the like are all made possible through the use of cell phone towers and 3G connectivity, but enough with the analysis of the internet – let’s answer the real questions about internet access on the Everest Base Camp Trek! Probably the easiest and most common way of connecting to the internet is by using your mobile phone. Since 2010, there has been 3G connectivity on the Everest Base Camp Trek thanks to the Nepalese telecommunications company, Ncell. The company, a local subsidiary of the Swedish company TeliaSonera, has installed multiple base stations in intervals along the trek, starting in in Lukla and going all the way up to Gorak Shep. This provides connectivity for the entire Everest Base Camp Trek as well as all the way up the mountain to the peak of Everest. The mobile internet is fast enough to browse and even make video calls, proving to be a great alternative to pricey satellite phones that were used in the past. Signal is never 100% guaranteed as with anywhere in the world, so there will be certain dark spots along the trek where connection may drop. For this reason, climbers attempting to summit Everest tend to stick to the dated yet trusted satellite phones as their lives are often at risk. That being said, for the thousands of trekkers who take on the Everest Base Camp Trek each year, mobile internet is definitely sufficient for their needs. Multiple reviews have all come back positive, saying that the mobile internet was perfect for getting in touch with loved ones back home, checking emails and posting pictures. 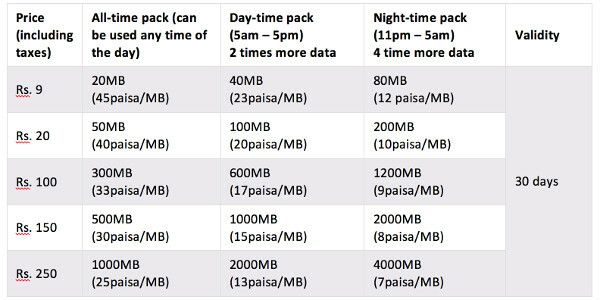 Here is a breakdown of a few data packages provided by Ncell (this is correct as of 2017). Please note that US$1 = ~Rs.100. At the time of writing, US$ 1 is worth Rs. 110 meaning the anytime 1GB package valid for 30 days will cost you about US$ 2.50. 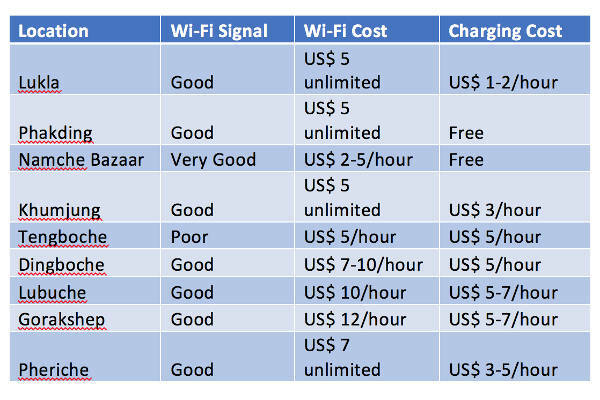 As you can see the rates are very affordable and the connectivity is reliable with Ncell investing millions of dollars each year to improve and widen the range of the base stations. More traditional Wi-Fi hotspots are available on the trek, but we don’t really see a point of using them as there are only two free hotspots along the trek and those are at the Starbucks in Lukla and at the bakery in Namche Bazaar – the rest of the hotspots will charge for usage. Wi-Fi hotspots are obviously restricted to certain areas along the trek and the internet speed will slow down significantly if many people are using them at the same time. For this reason, we recommend buying a SIM card and using 3G. Not only is it not restricted to certain areas but it also allows you to contact other tour members or your guide while on the trek, many miles away from a Wi-Fi hotspot. Many of the hotspots listed are dated, pricey and unreliable. If your intention is to use a few GB’s of data while in the region, purchase a SIM card and data bundle in Kathmandu and you will be blessed with reliable connectivity almost everywhere you go. This is perfect for mobile phone usage and even laptop use, provided your phone can create a Wi-Fi hotspot. If, for some reason, you intend to use masses of data and need a faster internet connection, you can make use of the various hotspots along the trail. They will charge a heftier fee than the mobile alternative, but that is for you to decide. As time progresses, connectivity continues to improve in the region. Be sure to check up on any recent announcements and updated prices to ensure you are choosing the best option that will give you the best value for your money. Hi Mark, I have a Verizon Google Pixel XL, can you provide more details regarding SIM cards? Is it just an easy swap? My only need for a mobile phone during our trek is to maintain contact with loved ones back home. Does the SIM card change anything on my phone? Do I just swap cards and purchase minutes? I have the Viber app that I can use if I have WiFi. Hi James, yes, it is an easy swap as long as your phone is unlocked (i.e. you can put other providers into your phone). The SIM should not change anything on your phone, but in terms of accessing your contacts if they are stored on your Verizon SIM and not on your phone then you won’t be able to see them when you put a Nepalese SIM into the phone. When you get to Kathmandu ask your tour operator or guide to take you to a phone shop in Thamel and just purchase a SIM with prepaid minutes. Hope this helps! I have been reluctant to commit to a trip in October this year because I need to have internet access each day for up to a couple of hours to return emails so my business keeps running while I am away. This news about good access is wonderful as it means I can fulfil a lifetime ambition without crashing my business in the process. 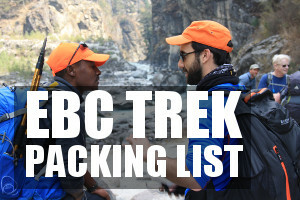 We are doing the 3 passes trek – do you happen to know if the connectivity you have described is the same for this trek. 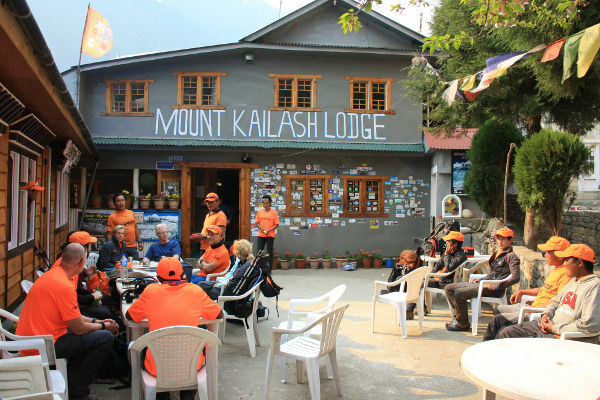 Hi Greg, great to hear that you are going to complete the 3 passes trek, it’s an awesome experience. Internet connectivity on the trek can be a little sketchy, especiallly on either side of the Khumbu Valley. At a maximum you might have intermittent spots for a day or two of no connectivity, but overall you should be fine. I recommend purchasing a local sim and topping up with lots of data. All the best! Only just found your response – thanks for the reassurance – can you suggest which company is best to go with for the sim – some blogs say get 2, one with each of the major companies NTC and nTell. Does this sound correct ? Initially, I was going to take my 4g ipad and slip a sim in it but have so much desktop based material that I need to access that I think I need to take a small laptop and use the hotspot from my iphone. Do you have any experience with this way of gaining internet access. Hi Greg, I’ve only used nTell but I don’t think there is any harm in having two sims, just in case. Sims and data in Nepal are quite cheap. Yip, I usually use the data on my phone and if I need to use my laptop I create a hotspot. You can also buy Everest Link data bundles at teahouses. These are pretty good, but not very cheap. All the best! In addition to the lodges marketed wifi access, Everest Link proposes its own wifi packages. Far cheaper (for instance 10Go at 2000 NPR oct-18). And more powerful than the 2G data service supported by NCell (3G only at some locations in oct-18). Hi there – do you know if there’s any cell coverage in the valley from Namche to Thame? I think I’ve seen that it stops at Thame so there’s nothing from there up to the Renjo La, but if you have any more info (or could confirm that) it would be really helpful.